Healing hands: Health students have been providing health checks to doctors, nurses, allied health workers and other staff at Lismore’s St Vincent’s Hospital and St Joseph’s Nursing Home. 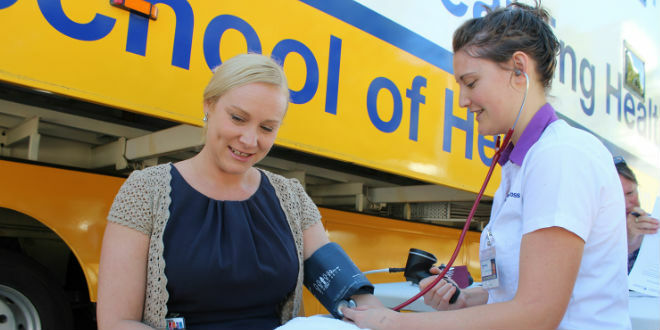 HEALTH students have been providing health checks to doctors, nurses, allied health workers and other staff at Lismore’s St Vincent’s Hospital and St Joseph’s Nursing Home out of the Southern Cross University Mobile Health Clinic. Students studying osteopathy, clinical exercise physiology, nursing and occupational therapy at Southern Cross University delivered the week-long health and wellness program in April as an experiential learning opportunity. “Health care workers who do such a wonderful job of looking after our needs often neglect their own,” the university’s project leader for Simulated Learning Environment Grant, Dr Louise Horstmanshof said. “A recent national survey of more than 6000 nurses by Southern Cross University, for example, found that many in the profession are failing their own health checks and feel unhealthy. The SCU Mobile Health Clinic operated from the St Vincent’s car park. Portable: A view from inside the mobile clinic. The clinic is housed in a semi-trailer with expanding side capsules and fitted out with a variety of medical equipment to create a consulting-room atmosphere. “Using the SCU Mobile Health Clinic as their base, our health students will have the opportunity for experiential learning as they offer advice and treat St Vincent’s and St Joseph’s staff to gain a better understanding of primary health care in the community,” Dr Horstmanshof said. 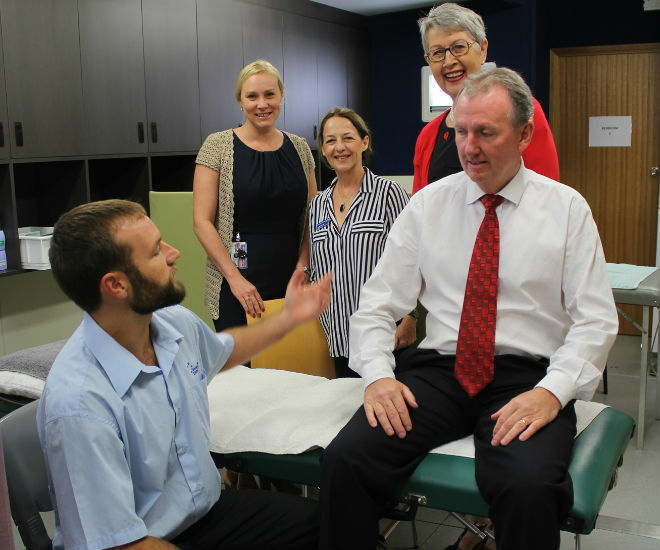 St Vincent’s Hospital Campus chief executive officer Steve Brierley said the opportunity for staff to get a mini health check was a good reminder for them to look after their health. “As health professionals we value the importance of talking to specialists about health and so this is a great time for us to check our own health and wellbeing,” he said.